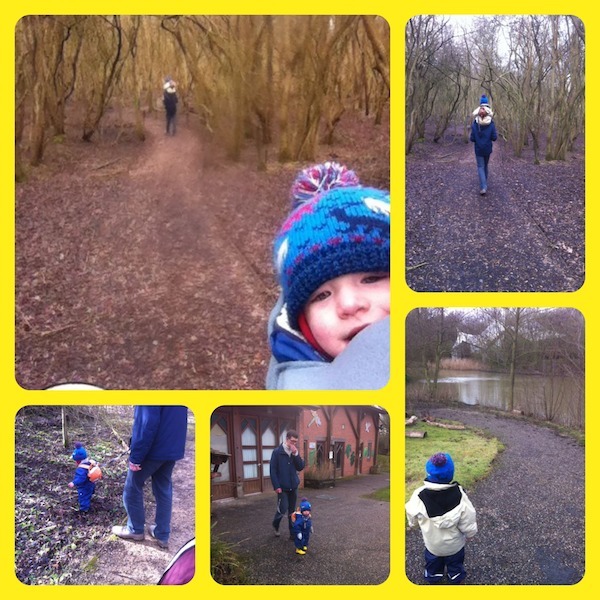 For his birthday, Tom was given a family ticket to the Conkers centre near Ashby de la Zouch. My Grandma had seen an offer online and decided to buy this for Tom for us all to enjoy. We had to use the ticket within 30 days of its purchase, so despite the slightly dodgy looking weather forecast, we decided to go for it this weekend, because there was no guarantee it would be any better next week when we had to use it by. But actually I think we picked a good time of year to go – it was very quiet, there were hardly any cars in the car park when we arrived and left, and this meant we had lots of parts to ourselves or with very few others around; I can imagine it gets packed on a warm sunny day and we’d have had to queue for the train ride, for example. We started off by walking out of the main entrance building – the Discovery Centre – and around the edge of the lake that’s just in front of it. As we neared the train station, a train was just pulling up, and as there was no queue, just one family on the platform getting on board, we decided to hop on it there and then – once Andrew has seen a train, it’s very hard to drag him away again anyway. 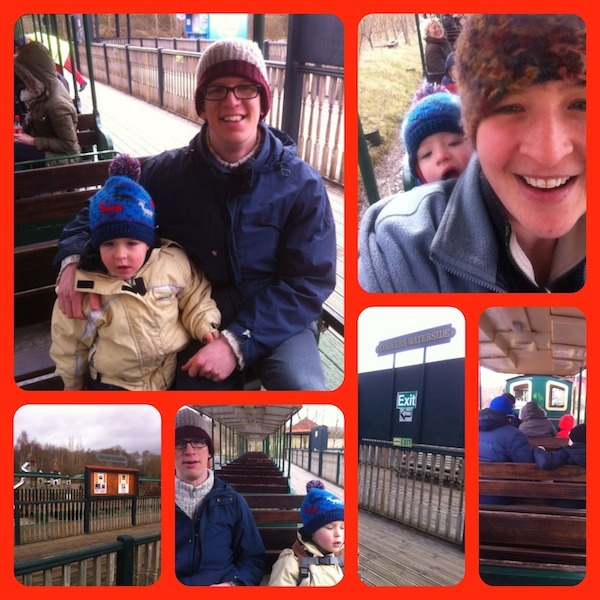 It was a lovely little ride, and the boys enjoyed looking out at the trees, tracks, tunnels and other bits of the park that we could see. 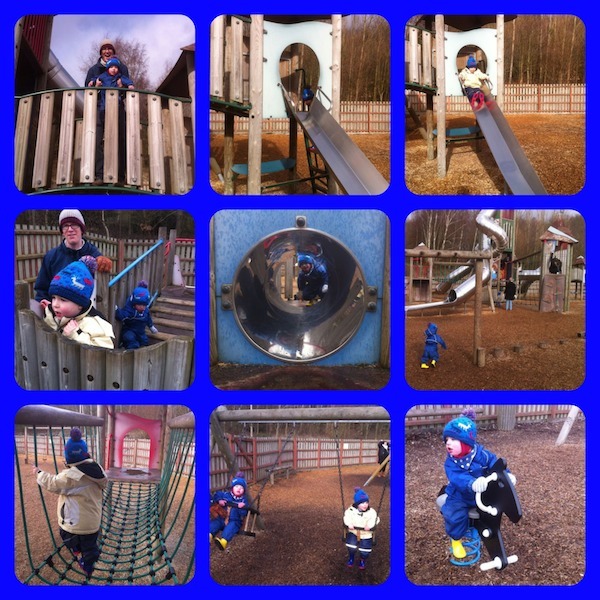 This took us to the other side of the park, to the Waterside Centre. Right next to this station is a huge adventure playground, with equipment for all ages from toddlers to pre-teens. The boys were off there as soon as they dashed off the train, trying to climb up the tall towers first before coming back down to the climbing frame and swings that were more their size. Andrew likes watching older kids on aerial runways, so although he felt he was too small for the long one here, he was happy to watch me have a go and cheer me on! We stayed here for a good half hour or so, with a few intermittent spots of rain, and other people coming and going during that time. Next we went into the Waterside Centre, mainly to use the toilets and nappy change facilities, which were all very quiet too. We spotted a table with a craft activity going on downstairs, so we took a look – they were indeed providing the materials to make your own Gruffalo mask! As Andrew is a big fun of the Gruffalo (I thought there was no such thing?! ), we had to stop and make our own, which was just right for his age, with some help from me to read the instructions and direct him with the glue. We also spotted a table next to the craft which had all the culinary dishes mentioned in the Gruffalo book – roasted fox, scrambled snake and Gruffalo crumble – made out of junk modelling stuff and papier mache. They were brilliant, just how you could imagine a Gruffalo meal looking. Then it was time to go back outdoors for a bit, and walk along the trails on this side of the park. We walked around another small lake, then into the woods. It looked like a great place to build dens and play hide and seek, particularly in the summer when the trees would have leaves on and cover the area with foliage more than on this winter’s day. The path was suitable for a buggy, though we used the buggy for transporting our bags rather than the boys – they both walked some of the distance, and then one by one they got up onto our backs/shoulders as they got tired. It was just the right length of walk for us with kids whose legs are on the smaller side, though there are many more paths to explore on the other side of the park near the Discovery Centre, which is bigger than this side. 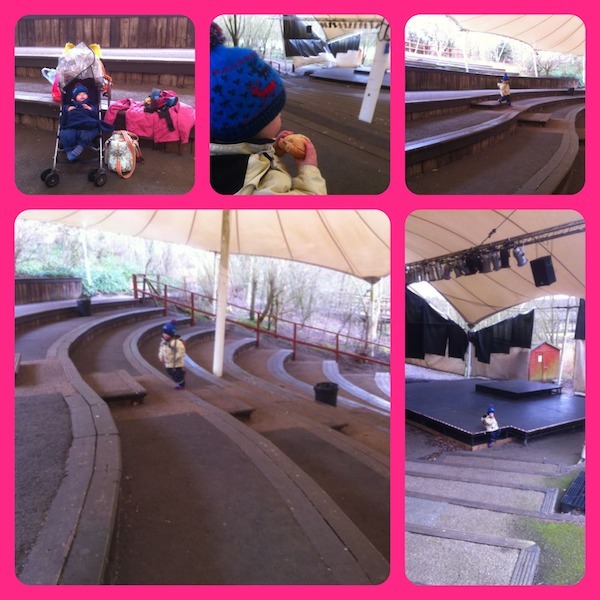 We came to an opening with a covered outdoor amphitheatre. This is where we had planned to eat our picnic lunch, after I’d tweeted the centre the day before and asked if they had anywhere sheltered to have a picnic. This was a good recommendation – it kept us sheltered from the wind and kept Andrew amused with all the steps up and down that he insisted on doing whilst eating his sandwiches! There was of course plenty of space to sit down; nobody even walked through the amphitheatre whilst we were sat eating, looking terribly British with our outdoor picnic in winter. Having done a fair amount of what was on offer over this way, we headed back to the train which took us back to the other side of the park. Again there was just one other family and us on the ride. 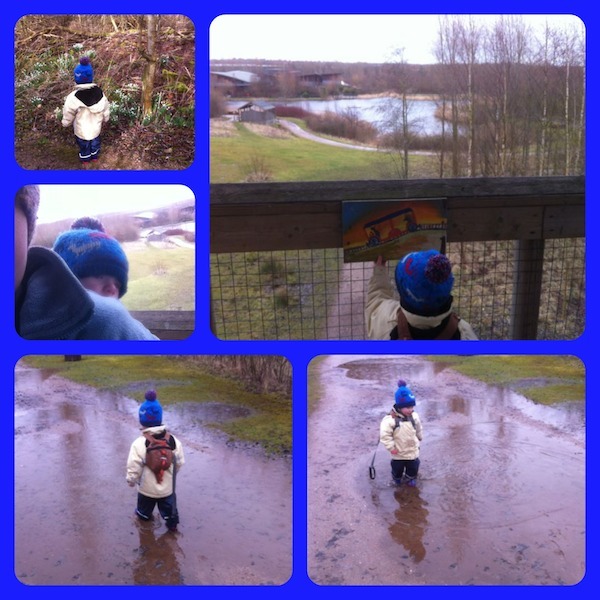 The rain became more set in as we got off the train and walked around the lake where we had started off the day, but it didn’t really bother us – we were all togged up, and Andrew had a whale of a time jumping in some awesome puddles that came to the top of his wellies in places. One place we could shelter for a bit was a covered viewing tower with a view across the park. The boys enjoyed going up the stairs, and we could hardly drag Andrew away, as he insisted that he wanted to keep going up and down them over and over again. We looked on the map that we’d been given at the entrance, and noticed that there was a labyrinth a little further round, which was enough to entice Andrew away from the fascinating steps of the viewing tower. He had done a lot of walking though, and at this point he got into the buggy for a ride around the labyrinth. There was a ‘spot the fairy’ activity as we went round, and Andrew was put in charge of counting up the fairies pinned to the walls. It was quite a long maze; at each turn we wondered how far it would be until the end, but eventually we came to the middle – a fairy house. 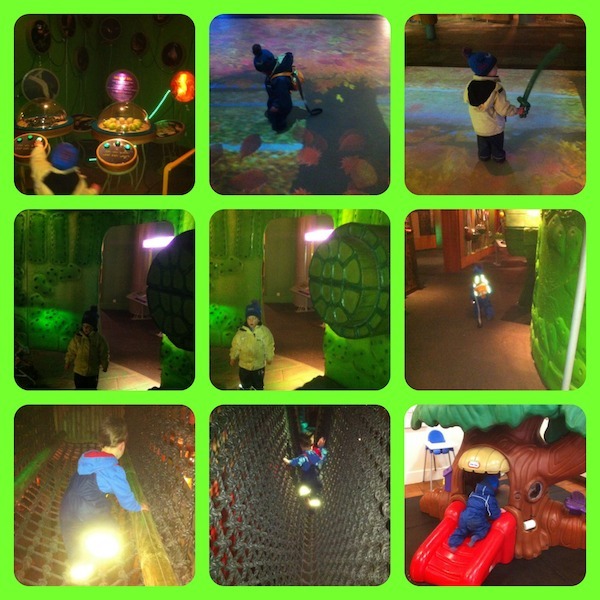 As everyone was getting tired, we headed back to the Discovery Centre for some indoor fun. There is a lot to see and do in there! We learned all about different aspects of the environment in the fantastic hands-on exhibition. The giant model of a leaf was particularly popular with the boys, as we got to stand inside it and look at the cells and press buttons to see the various parts that air, water and sugar pass through – this took me back to A-level biology, this would have been a great place to go to get to grips with plant cell functions. I can imagine that this gets used for school trips in the week, it’s an interesting place to learn and all done very thoughtfully. Of course our boys didn’t learn as much detail as older kids would, but it was accessible on many levels, and they just loved looking at all the interactive displays and getting the sensory experiences. In amongst the educational bits, there is an ‘enchanted forest’ soft play area, up above some of the displays in a dimly lit (but in a good, mystical way) environment. It was only suitable for preschoolers upwards, so Andrew went up (with a bit of help from me to begin with to suss it out before he knew it was fine on his own), and Joel stayed down with Daddy, running around the fun exhibits, and finding the toddler play-tree in the cafe. Again, the soft play was all really well thought out, with lots of enclosed rope bridges and bits to climb over as if he was in the tree tops. Considering he had been flagging outside, he managed to regain a fair amount of energy to run off in the soft play – he always has a reserve of energy for soft play it seems. There was also a Pirate entertainer hanging around in the big foyer, but unfortunately we weren’t there at quite the right time for his shows, though Andrew did get very excited about the balloon sword that he got from the Pirate’s stall. As Joel hadn’t napped all day, we knew that he was getting exhausted with all the running around, and decided to slowly head back to the car. It was hard to drag Andrew away, but the encouragement of a drink and a biscuit was a help, and he’d earned it with all his running around too. There was just enough time to call in at the gift shop and buy the inevitable bouncy ball – the boys’ favourite kind of toy souvenir. All in all it was a fab day out, with activities indoors and outdoors for children of all ages. It’s well worth the entrance fee (which we of course received as a present). If you live near enough, there is even a yearly members’ ticket, which I think would be worth it if you could go more often than us. We will definitely be back again, and when the boys are a bit older, there will be different things for them to enjoy and get out of it. Disclaimer: I received no incentive to write this post, and the views expressed are my honest opinions of our day out. A whole day of family fun with activities both in and outdoors, what a lovely present to receive! It’s great that there was also a sheltered area to eat your picnic as the current weather has been so unpredictable. Thanks for linking up and sharing your fun with Country Kids. It’s a fantastic place to go, lots of fun!